Despite advances in healthcare, maternal morbidity and mortality rates have been rising over the last three decades. Potential contributors to this alarming trend include advances in assisted reproductive technologies allowing women to conceive at older ages than previously possible, an increasing number of pregnancies affected by chronic diseases, a rising cesarean delivery rate resulting in complications such as abnormal placentation, and medical advances allowing women with complex illnesses to conceive. Expert consensus has endorsed simulation over traditional teaching methods for improving learner skill and patient outcomes, particularly in a setting of rarely encountered illnesses and increasingly complex patients. Maternal cardiac arrest simulations are one of the more extensively studied obstetrical critical care scenarios, and participation has been associated with improved learner performance. With such promising data in the setting of growing numbers of obstetrical simulation programs, a logical next step is the incorporation of obstetric critical care scenarios into simulation curricula. 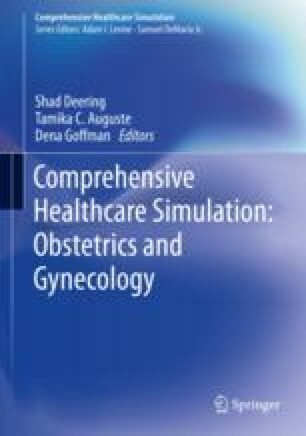 This chapter will discuss the use of simulation for teaching critical care obstetrics. American Academy of Pediatrics (AAP). Neonatal resuscitation program. http://www2.aap.org/nrp/7thedinfo.html. Accessed 24 Feb 2017. American Society of Anesthesiologists (ASA). Maintenance of certification. http://www.asahq.org/education/moca. Accessed 24 Feb 2017.